COLUMBIA, S.C. (CNS) — A new era and a distinguished new title has come to St. Peter Church in downtown Columbia. It was announced June 24 that the historic house of worship will now be known as the Basilica of St. Peter. It is the first minor basilica in South Carolina and the 85th in the United States. The announcement came before packed pews at the 11 a.m. Mass, which was celebrated by Bishop Robert E. Guglielmone of Charleston. The news had added significance because it was the feast of the Nativity of St. John the Baptist, the patron saint of the statewide diocese. Father Gary Linsky, pastor at St. Peter, read aloud the official declaration from the Vatican’s Congregation for Divine Worship and the Sacraments. There are only four major basilicas, all in Rome — St. Peter’s, St. John Lateran, St. Paul Outside the Walls and St. Mary Major. Minor basilicas are located both in Rome and around the world. Churches given that title must be of historical, artistic and architectural importance, and have significance as a center of worship. The idea of seeking the designation of basilica was first proposed in late 2016 by Mark Husey, former music director at the parish. Two parishioners, Darryl Williams and William Neglia, helped with the research and extensive documentation that was needed; Father Renaurd West assisted with translating the application materials from Latin into English. Father Linsky said there were 117 specific questions that needed to be answered. The entire process took about 18 months, which is unusually quick by Vatican standards, Father Linsky said. 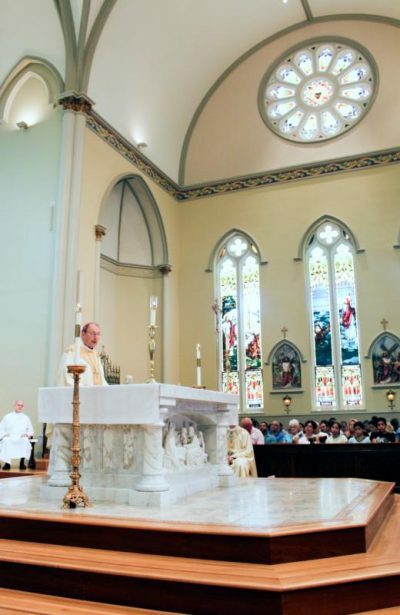 “There is an overwhelming sense of awe at the honor we have received from Rome, and now that honor brings with it great responsibility,” Father Linsky said after the Mass in an interview with The Catholic Miscellany, Charleston’s diocesan newspaper. St. Peter was established in 1821 when Bishop John England sent Father Dennis Corkery to Columbia to minister to Irish laborers who were building the Columbia Canal. Construction of the original church started in 1824, and that building survived the burning of Columbia during the Civil War. The current church was built in 1907. St. Peter is the only church in the Southeast, aside from one in Miami, to have hosted a papal visit. St. John Paul II visited the parish for an ecumenical prayer service during his trip to Columbia in September 1987.